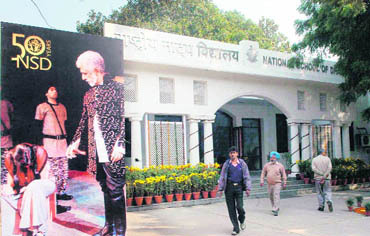 Last year, when the National School of Drama celebrated its golden jubilee, the timing caused raised eyebrows in theatre circles because there was a gap between NSD’s conception and inception. After the idea of setting up a Central institution was mooted at a seminar in 1954, a draft scheme was prepared in 1955, and the Sangeet Natak Akademi (which had Jawaharlal Nehru as its president at that time) resolved to establish a school for theatre, which would not only offer professional training of the highest standards but also serve as a laboratory for research. The School was to look after technique and theory in respect of modern as well as ancient theatre. 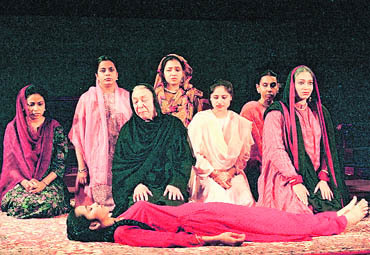 Before things could actually materialise, independent of the government initiative, the Bharatiya Natya Sangh, with assistance from UNESCO, established (in 1958) the Asian Theatre Institute where the stress was to be on children’s and rural theatre, and on training for theatre in different regions, with the aim of giving direction to regional theatres. When this institute approached the government for funds, it was decided to merge the two schemes, and, the thus ATI was re-christened as the National School of Drama and Asian Theatre Institute. 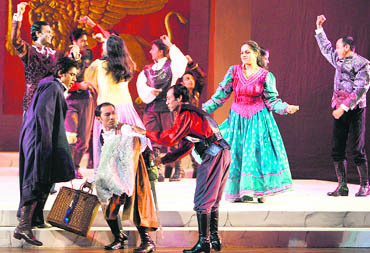 As this had happened in 1959, theatre buffs expected the golden jubilee celebrations to begin in 2009. Apparently, the clubbing of the twin schemes was a pragmatic compromise but, in effect, it turned out to be a rather ill-advised one because it implied clash of aims and interests. While the financing agency — the Sangeet Natak Akademi — maintained that the School was primarily a theatre-training institution, the BNS insisted that the primary aim had to be the development of regional theatres. When the Royal Academy of Dramatic Arts (RADA)-trained Ebrahim Alkazi took over as Director, the BNS-recruited faculty — mostly people with experience of regional theatre, but without any institutional training — felt ill-at-ease as they could not cope with the requirements of professional training, they felt left out. Isolated, Alkazi found himself working almost alone. Of course, because of his background, he produced wonderful results, but the NSD almost became a one-man institution. Training wise, his programmes were superb and the trainees who passed out from the School dazzled the entire country with their sterling work. But his detractors tried to play down his contribution through a variety of charges. Always on the mat, Alkazi grew hypersensitive; while the adulation of his students sustained him for quite some time, he finally opted for self-exile. Seeing things objectively, it is possible to aver that Alkazi was a man of destiny who did precisely what was absolutely necessary in the given situation. Today, if theatre has come to enjoy respectability, it is because of his quest for excellence and daring departure. As S. Ramanujam said, "Alkazi did not channelise his students into one pattern of resentation. Having grasped the basics of the language of theatre, his student could build his own kind of theatre. After Alkazi, though the core has been retained, there has been a lot of mindless tinkering; thus the NSD training has lost its erstwhile holistic quality". Unfortunately, chaos prevailed when he left the NSD. For a long time, practically every new director descended as a crusader bent on overhauling only to realise that things were not as simple as they believed. B.V Karanth, who succeeded Alkazi, had the best of intentions but, being basically from the regional theatre, he had a different vision. As Alkazi’s student, he had been influenced by his mentor’s way of thinking but not by his grand and glamorous style of theatre. After Karanth, the NSD had B.M Shah as director, who had neither Alkazi’s vision nor Karanth’s revolutionary ambitions; his successor, Ratan Thiyam, did try to re-orient the system his own way but was foiled by the faculty politics. Mohan Mahrishi’s strategy to overhaul the programme through a zero-year was also met with open hostility; it was during Kirti Jain’s uneventful tenure that much of the post-Alkazi controversial dust got settled. And then came Ram Gopal Bajaj who injected into the School a new life by pursuing all kinds of areas — more staff, more visiting faculty, more extension programmes, more active Repertory, more accommodation for the School, more performing spaces, and, above all, more varied festivals, including the now internationally celebrated Bharat Rang Mahotsava, which was started in 1999. Indeed, now, if the NSD appears to be back on tracks, it is largely because of Bajaj. However, today, although the School has a much bigger budget, a stronger faculty, better paid staff, more commodious campus, increasing number of regional centres, a vast network of workshops, there is a growing feeling that the training has lost its erstwhile soundness and that its productions have lost brilliance. In fact, some of them have been rated mediocre and amateurish, even as some have proved to be financial disasters. 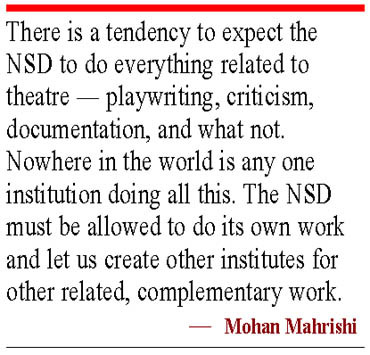 The NSD and its Repertory have played a historic role in introducing modern theatre, raising theatre awareness, popularising theatre, building audiences, developing tastes, setting standards, providing models, and inspiring groups. Now, no one — not even Alkazi’s bitterest critic — dare deny the role of the NSD in breeding a new generation of actors and theatre professionals, in creating an actor-oriented director’s theatre and in breathing life into a near-dead Hindi theatre. In Alkazi’s time, since Indian theatre was trying to find its feet, the focus was primarily on training and production; in fact, realising this, he would combine his twin roles as a teacher and as a director in such a way that theory and practice went hand in hand and even rehearsals tended to become classrooms. Since that facilitated fresh students working with professional artistes of the Repertory, his training produced such celebrated stars as B. V. Karanth, Amal Allana, Om Shivpuri, Manohar Singh, Bansi Kaul, Naseeruddin Shah, M. K. Raina, Mohan Mahrishi, Uttara Baokar, Surekha Sikri, Nadira Babbar, Neelam Mansingh, Anamika Haksar, Om Puri, Ranjit Kapur, Bhanu Bharti, Pankaj Kapur, Rajendra Gupta, D. R Ankur, Anupam Kher, et al. After Alkazi, as the nature of training underwent change and the Repertory became an independent, itinerant outfit, the productions started reflecting the philosophy of the NSD directors as well as of the visiting directors. Thus against Alkazi’s grand, well-designed and expensive productions of dramatic masterpieces, productions of Karanth’s time were marked by folksy theatricality, intuitive improvisations and the abundance of music. Later, while B. M. Shah leaned more on Parsi style and Ratan Thiyam on classical tradition, Mohan Maharishi was almost Alkazian in his insistence on realistic methodology. Kirti Jain’s period was known for eclectic balancing among classicism, tradition and modernity but, by and by the productions lost characteristic identity and the NSD lost its pride of place as the pioneering model — especially because the productions were eclipsed by the experimental novelty of the work being done. Also, once the media started attracting the NSD graduates, the trainees’ motivation underwent a sea-change. Besides the Repertory, the NSD has witnessed a most conspicuous growth of its extension programme all over the country. Started in 1978, it has held hundreds of performance-based intensive workshops with amateurs, children, students and teachers of theatre. The training in workshops has also been extended beyond acting to direction, designing, crafts, technology, etc. The first workshop at Madurai has been celebrated as a new beginning in the theatre movement. The documentation of the workshops has been extended to documentation in general and the School has started developing its own archives in audio and visual materials. There has also grown a wing called Theatre-in-Education which, inter alia, organises regular festivals of children’s theatre. In fact, the NSD has perfected the art of organising theatre festivals and theatre melas, the most elaborate being Bharangam, which is now Asia’s largest festival devoted to theatre. Publication is yet another activity through which the NSD has been serving theatre: besides dozens of books on theatre, it has to its credit a quarterly in Hindi (Rang Prasang) and a biannual journal in English (Theatre India). Incidentally, the emergence of comparative superiority of regional work during the movement lent such edge to the criticism about the NSD’s alleged bias towards Hindi theatre that the very ‘national’ character of the School came to be questioned. The clamour for more regional/national training schools forced the government to set up Haksar Committee. The committee’s report was allowed to gather dust except that, as a pilot project, a Regional Resource Centre was set up at Bangalore in 1994. It is only recently that along with the move to create more central universities, IITs, IIMs, etc., the government has decided to establish four more NSDs and very recently (on February 18) the first new NSD was inaugurated at Bangalore. One can only piously hope that it would mean neither the replication of the present NSD nor the creation of isolated gharanas. In jubilee years, it is customary not only to celebrate but also to take stock — to reckon with both strengths and weaknesses. Thus while conceding a meaningful contribution of the NSD, one must not forget to point out what still clamours for urgent attention. For example, it has been repeatedly lamented that the School has failed to respond effectively to the rural and regional demands, it has been a victim of inbreeding, its area of specialisation is narrow, it is letting huge investments on its training programmes be devoured by the cinematic media, its quantitative growth has been at the cost of quality, and that it has not played an effective role in promoting playwriting, research, criticism, theory, and teacher training. In a recent seminar on training methodologies, it was heartening to note that there is adequate awareness of the problems and that the search for solutions has begun.